Winter is my favorite. If you ask many Indians will say the same. It brings the lovely climate with chilling cold and nice romantic atmosphere. If we step in a multiplex, we can see a parade of ladies and gentlemen in their most attractive woolen attires. If I am right, most of the upper class and upper middle class people in India have collections of woolen clothes that lie in special wardrobes, which are open during the winter season only. Now, let’s take a look at the other end of the society. This is that end of the Indian society, where people have to work daily to eat daily. If not so, they have to keep on counting the amount received in the month compared to the expenses they have to make. In such condition, they don’t think about buying luxury or comfort clothes. I have myself seen people inserting newspapers in their regular clothes to prevent themselves from chills. Godrej, the name itself is synonymous with Trust and care. The one among the many products from Godrej, Godrej Ezee is specially designed to take care of those precious woolens. Along with the caring for woolens Godrej Ezee decided to care for the people, who actually needs it. An initiative, a campaign that was launched with real good thought and compassion towards that other end of Indian society. With the noble idea and a desire to make a change, the whole strategy of reaching maximum people and creating awareness, the campaign was designed. Nothing can beat digital media in today’s era. Ezee made a point to reach maximum people, create major awareness so entire project was designed by keeping digital media in the center. #EzeeHugs campaign with a noble cause and good initiative splurge up. When you start a good initiative, good people start gathering together. Same thing happened with the Ezeehugs. With utter support of OLA cabs, RJ from Fever 104 FM and NGO Aarohan, 145 schools from Delhi/NCR, #Ezeehugs collected more than 76000 woolens. Top 145 schools from Delhi/NCR got along with the idea and urged students to donate woolens to bring smile on the faces of underprivileged children. 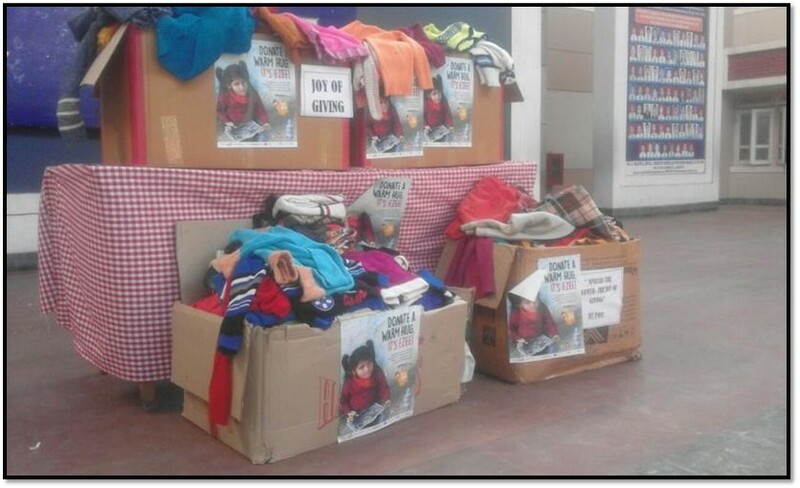 The Ezeehug campaign announced on radio, print media and social media received terrible support from the people, where they reached out to Hindustan Times collection centers to donate. RJ Sid reached out to students at DU and held a challenge to bear the chills without sweater for 10 minutes. Though students took part in it enthusiastically, but no one could bear chills for more than 4 minutes, so just think of the poor kids, who are left with no options. This led to a major awakening among the people to realize the condition of kids. Sometimes, people think to donate, but they cannot or things get delayed. Understanding this situation Ezeehugs to collect donations from doorsteps. So Ezee collaborated with OLA cabs. A caption of Ezeehug was added in their mobile app where they can simply enter the details from where to collect. The huge numbers of OLA cabs and their drivers contributed to pick up the donation. Reminder SMS, Emails and notifications were sent to the donors to remember to donate. Together we stand strong, together we can break rocks. The whopping figure of 76742 donations broke all the records of previous years. All the woolens are then washed and cleaned with Ezee so that happiness can be handed in the form of soft and fluffy woolens. Aarohan NGO redistributed all woolens to the deserving kids. Ezee understands so it cares. A small gesture for extending help to underprivileged children has now grown manifold. Without the unparalleled support of Ezeehugs partners, this could not have been possible and impossible without the generosity of Delhites.